Whatever the size of your garden, from a small fenced yard to a paddock, a wheelbarrow is definitely up there with labor-saving must haves. Whether you're carting felled branches from the annual prune to the bonfire site, or simply want an easy way to get all your new garden additions from your car to their locations, a wheelbarrow takes the strain out of gardening. 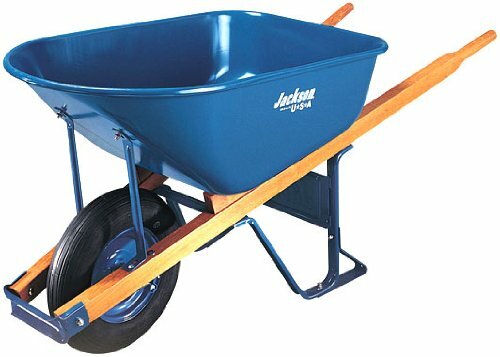 So, give fetching, carrying, and back ache the elbow, and invest in one of the selection of wheelbarrows we've reviewed below – and put some spin into your outdoor time. This is a high-strength poly garden cart with a steel frame. It's ideal for moving garden supplies such as sacks of bark, compost, and shingle around your yard taking the strain off you and saving your back from risk of injury. The cart is also strong enough to haul felled logs which is great if you need to build up a woodstore close to your home. However, make sure that you cut the logs to the size of the cart bed which is about 30”. The cart features a patented D-shaped handle which enables hookup to a lawn tractor or ATV. This is ideal for those in rural situations with a lot of land to work with. If you are towing the cart, take it slowly, and aim for wide and slow turning circles to ensure you don't put undue strain on the chassis of the cart. The cart is well-built, sturdy, reliable, and easy to assemble. It is, however, quite heavy to pull particularly on sloping surfaces even when empty. Thus, it may not be ideal for elder persons, or those with disabilities. Suited To: Moving heavy yard and garden supplies including felled timber, shingle, and paving slabs. Sturdy enough to handle rough terrain. Towing capability makes it ideal for those with an expanse of property, or who struggle with manual strength as the cart can be hitched to an ATV. 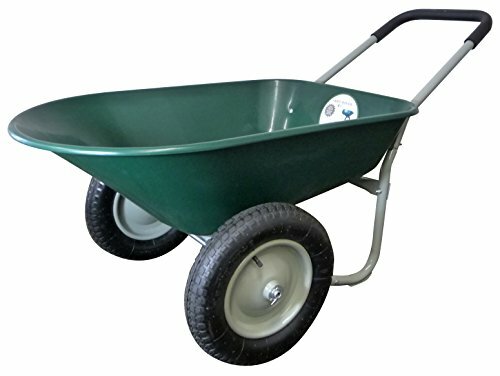 This is a lightweight push-along wheelbarrow designed for general purpose yard work like moving soil, plants, etc. The tray does have a steel base for added strength and durability but the handles are untreated wood. This means they are not weatherproof unless you coat them yourself. Plus, they are going to be rough on your skin after a long day of working with the wheelbarrow. Several instances of the wheelbarrow being shipped sans the front axle, or damaged, have been noted so this is something to be aware of. The tire is an inflatable rubber tire and won't stand up well to very heavy loads. 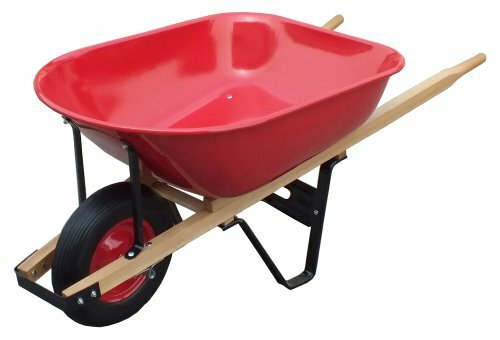 The wheelbarrow is a strong bright red color so it is easily visible even in an overgrown yard. Suited To: Moving plants and soil and other general yard chores. Not designed for moving heavy supplies, or for use over rough terrain. This is most definitely not Grandpa's yard cart! With a durable all-steel construction, the Aerocart can be tipped and pushed along upright serving as a dolly for crates, boxes, and even large lawn ornaments. At the same time, it can be pushed along like any other wheelbarrow if you're moving plants, soil, or other supplies that need a flat bed. While the Aerocart promises a lot – and, in certain circumstances, probably does deliver – it is let down by its shallow bed. 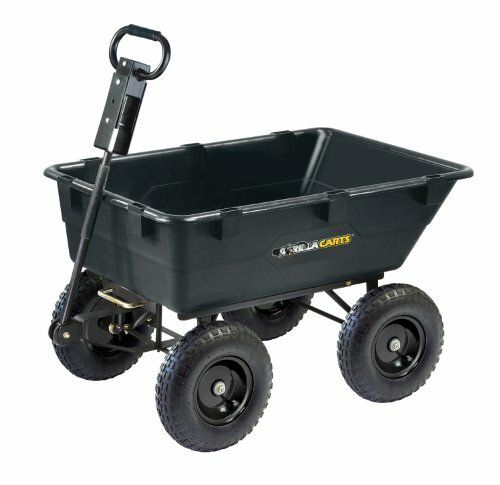 However, if you have a small yard that you want to cover over in shingle, bark, or topsoil, the Aerocart could be just what you need as you wouldn't be using as many bags of supplies, for example, as someone with a large garden. Once you're done with yard supply-moving, simply hose the cart down, and it can be a useful addition in the house, too. Suited To: Small yards which won't require a lot of supplies. In the upright dolly position, it would easily handle small hardscape elements such as statues and potted shrubs and trees, and would also be useful for household and garage tasks. Here's our full Worx Aerocart review. This is a lightweight cart designed for moving weeds and harvested fruits and veggies from A to B. The handle design makes it easy to push or pull with one hand. This is ideal if you have a large garden and want to take the cart with you as you weed, prune, or harvest. It can handle slopes very well, and doesn't tip over as it's being moved, or roll back once it's set down. The Yard Rover is easy to assemble and comes in three colors – standard dark green, bright pink, and a bright red ladybug design which your little gardeners (if you have them) will love. The Marathon is definitely designed for the most lightweight of yard tasks – so, no trying to move lawn ornaments or felled timber with it. That being said, it performs those lightweight tasks to perfection, and is easy to clean out once you're done. Suited To: Lightweight yard work, such as weeding, harvesting of fruits and vegetables, and carrying raked leaves. 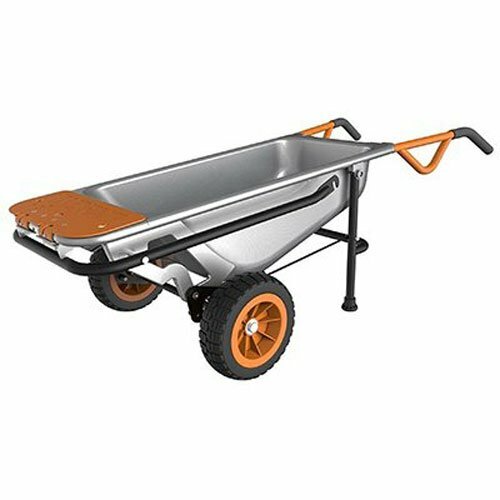 This wheelbarrow features a heavy-duty seamless steel tray which is fully braced with a front H brace. This construction ensures greater stability and increases the barrow's ability to handle heavy loads. The handles are wood which isn't ideal as they will need to be sanded smooth to ensure they don't damage your hands. They'll also need to be coated to weatherproof. For the price, rubber grips on the handles would have been a nice consideration as this is far from a cheap and cheerful wheelbarrow. However, handles aside, this is a workhorse of a wheelbarrow and can handle anything from large loads of topsoil or shingle, to cords of felled timber for firewood, right through to being used to mix quick-set concrete such as is used for fixing in fence posts, etc. For particularly petite individuals, this wheelbarrow may be a little heavy to handle, but otherwise, it's just what the working man or woman needs about the yard.